Pre heat oven to 350In a large bowl combine strawberries and rhubarb. Sprinkle in sugar and flour and lightly toss everything together. 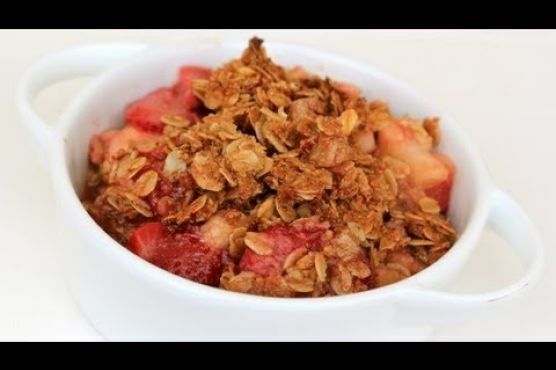 Pile fruit mixture into a pie dish (or a 9x9 Pyrex baking dish).In a separate bowl, mix together the ingredients for the oats, wheat germ, salt, cinnamon, brown sugar, maple syrup, and coconut oil (I find the easiest way to do this is with my hands). Spread the topping over the fruit mixture.Pop into the oven for 35-40 minutes or until the top of the crisp is browned and the fruit is bubbly. Enjoy!! Crisp works really well with Cream Sherry, Moscato d'Asti, and Port. A common wine pairing rule is to make sure your wine is sweeter than your food. Delicate desserts go well with Moscato d'Asti, nutty desserts with cream sherry, and caramel or chocolate desserts pair well with port.